You can fit the bike properly to your heights/ leg length and others too. An easy adjustment method means more than 1 person can use it. It is best practice to have a slight bend in your knee when the pedals are at the farthest point away from the seat. That is the leg should not be fully locked out to provide the most benefit and protect the knee and legs from pain or injury. You get themost efficient and effective low impact cardio workout. There are 3 general different types of seat adjustment. Rather than just move the seat to get a good adjustment for leg length you move the back of the bike. To make this happen the frame is in two pieces with the back half of the frame sliding inside in the front half. The join is in the middle of the bike. It is held in place with an adjustment knob and holding pin that is inserted into pre-set holes in the frame. The advantage of this method is that it is simple and effective but most importantly it helps in keeping a bike’s price more affordable. The holes are normally around an inch or so apart so you may find that you don’t quite get it all set up in the most comfortable position. If everything isn’t tightened up properly you can find that the front of the bike wobbles as you pedal especially when going faster. Similar to the previous method but the seat is on a slider of some sort, it uses pre-set holes and adjustment knob to keep the seat in place once it has been adjusted. So you are again have to adjust the position of the seat to be able to lock the seat in place which can result in the seat being slightly out from your most comfortable position. It may leave you feeling that you are either slightly cramped or stretched than you’d ideally like. 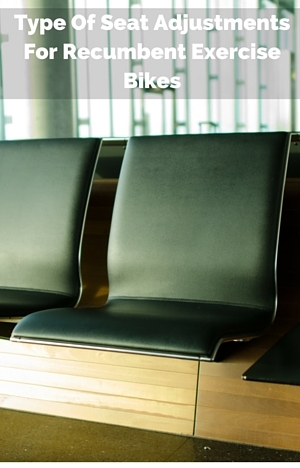 These seats on these bikes can be adjusted with just the one knob or up to three knobs to adjust. One of the most popular recumbent exercise bikes has this arrangement the Exerpeutic 900XL – where you have 3 knobs with 1 including a pull pin for holding it in place. A simpler arrangement is the one knob – much easier to loosen one knob then 3. Here again, you also need to ensure you can tighten the knobs up tight enough to hold in place and prevent the seat from wobbling. Depending on the model you can either do this while on the seat or do this while you are off the seat. These have a lever that you push or pull to release the seat so that it can be moved into the correct position. Once adjusted in position you that pull/push lever to lock it into position. There are no holes that restrict the positioning of the seat – you can put it exactly in the position you want it. The biggest negative of this is the cost with these costing over $250 for the ones you do off the bike and over $500 for ones that you can do while on the bike. The ones you can do on the bike are easiest to set the seat in the position. You can easily check you have it in position before you tighten in the place. There’s no back and forward if you get the adjustment wrong because you were off the bike. See the Ironman Fitness X-Class 410 Recumbent bike here. Most recumbent bike don’t have a vertical adjustment as such. Some do increase in height as you move the seat backwards to allow for different heights. The only recumbent exercise bikes I’ve come across that give you this option are the ones that have hand pedals – to be able to put yourself in a more comfortable position to use them as well as the foot pedals. There is the cost equation to take into account with this – moving the back of the bike tend to be on the most affordable bikes and lightweight bikes. If you are going to be adjusting the bike for different people frequently you also need to think about how easy it is for you to do. The pre-set holes for the seat and bike frame methods can be bought for less than $200, whereas the seat adjustment on a continuous scale cost more than $300 but less than $500, and for the ones where you can do this while on the bike can be bought for under $800. Also the other decision outside this whether it can be adjusted to fit your leg length which tends to be more an issue when you are below 5 ft 2 ins and over 6 ft as a rule. If you are looking for a bike under $200 and won’t be adjusting the bike often then the moving bike frame is likely to b okay for you. Otherwise, if you are likely to move the seat often and/or you think strength may be an issue then the movable seat is the way to go. Often the features on these bikes more affordable bikes are similar with them not coming with any extras other than a basic console – I like the seat adjustment method even though you may find yourself paying slightly more for this but it is much easier to do and the frame can be properly together. Being able to adjust the seat while on sitting on it is going to be the easiest to do but it is also going to cost the most. It’s important to get the seat positioned right for you to get the best level of exercise benefit. The choice between method is likely to be more important when looking at a bike under $200 where it may effectively be a major difference between the recumbent exercise bikes you are choosing – the frame adjustment vs seat adjustment.